If that picture isn't clear, the intention is that when you use heavy weights (relative to your 1RM), you'll use few reps, and when you use light weights (again, relative to your 1RM), you'll use more reps. In the classic pyramid, you will begin the workout with a weight that allows you to use relatively high reps. With each additional set, you will add some weight and decrease the amount of reps performed. An example of this would be: 10x100kg, 8x105kg, 6x110kg, 4x115kg, 2x120kg. In the reverse pyramid, you will begin the workout with a weight that allows you to perform very few reps. With each additional set, will take some weight off and increase the amount of reps performed. An example of this would be: 2x140kg, 3x130kg, 5x120kg, 6x110kg, 10x100kg. In the full pyramid, you will begin the workout with a weight that allows you to use relatively high reps. With each additional set, you will add some weight and decrease the amount of reps performed until you reach a target weight or rep range. You will then reverse pyramid back down to lighter weights and higher reps. And example of this would be: 10x100kg, 8x105kg, 6x110kg, 4x115kg, 2x120kg, 3x110kg, 5x100kg, 12x90kg. Why would I do pyramids? From what I've read, the classic pyramid isn't very effective for maximal strength or athletic training, because each set accumulates fatigue, limiting performance as the weights increase (so, you get to sets where you can only do 1-3 reps of the exercise, but with a weight that's closer to your 5-8RM). However, it's my understanding that (for reasons that, ironically, I don't understand) this method can be rather productive for building muscle mass. The reverse pyramid seems to be a little more productive for max strength training, because the heaviest sets can be performed properly. The additional sets with lighter weights then allow the lifter to build up a higher amount of volume, which may be useful for practicing technique and promoting hypertrophy. For the same reasons that classic pyramids aren't usually ideal for max strength, full pyramids aren't, either. However, like reverse pyramids, full pyramids do allow the lifter to practice technique and accumulate more volume, which is again good for hypertrophy. 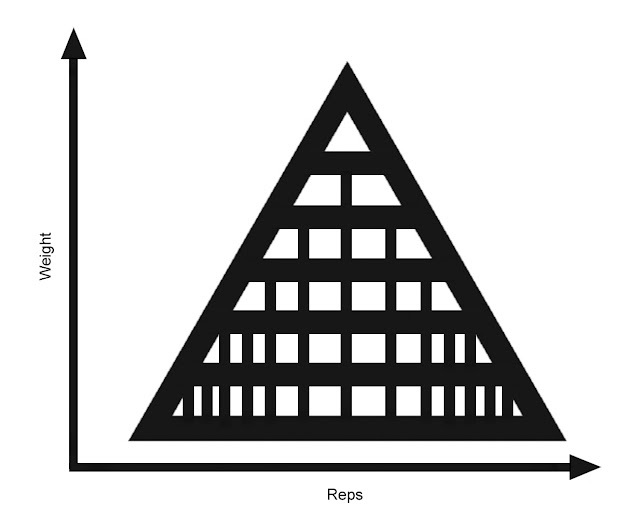 Another benefit to pyramid training is that since it allows you to work at different loads and in different rep ranges, different motor recruitment patterns can be utilised, different muscle fibres fatigued, and different energy pathways activated, providing the lifter with a broader scope for progress. Only done full pyramids a few times, really don't like them, rather get tired on heavy than light. They work are a good training, I just don't like them. Classic however, different story, love 'em to bits. I prefer the reverse pyramid, personally, which is more or less what I've been over the last month to peak for competition. I had steered away from them for a while, after reading in the Max-OT articles that the down sets cause you to go softer next time, but when I stop and think about it, that doesn't gel with my experience. I also like methods that have signs of pyramid training in the way the weights change each set, but don't fit neatly into the concept of either adding weight and decreasing reps or dropping weight and increasing reps. Things like complex training and Nick Horton's Squat Nemesis.